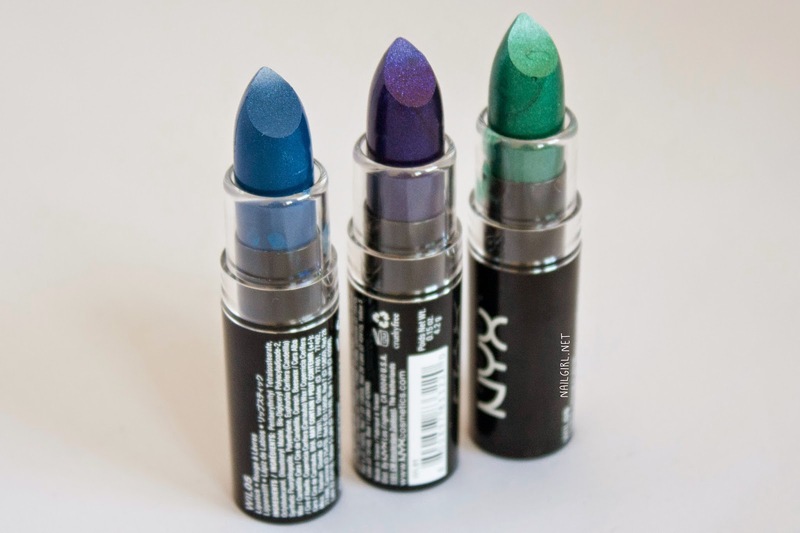 Some of you may know that NYX recently released a collection of gorgeous jewel-toned lipsticks. Some of you may also know that I have a weakness for vampy and odd coloured lipsticks - so naturally, I bought three lipsticks from the collection. From left to right: Sinful, Betrayal, and Risqué. 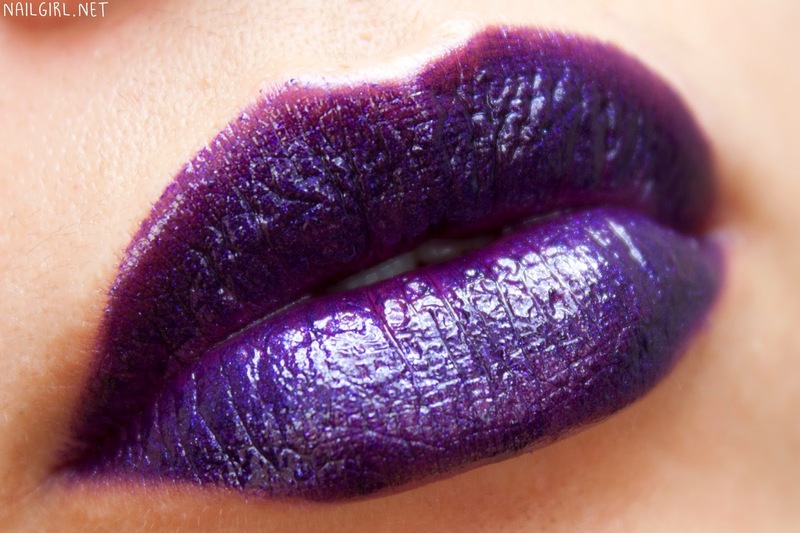 Betrayal is a beautiful deep purple lipstick with blue shimmer. I didn't find that the shimmer translated well onto my lips (in photos and real life). This lipstick has the most slip and has the glossiest finish of the three that I purchased. I know this is normally nail polish lingo but I would describe the finish of this lipstick as a jelly - sheer but buildable, and very glossy. It reminds me quite a bit of Lime Crime Poisonberry, however I don't own Poisonberry so I can't compare. It leaves a VERY pink stain on the lips when removed! Risqué is a beautiful emerald-toned lipstick with gorgeous, visible green shimmer throughout. This is easily my favourite of these three, colour and formula wise. It was not as slippery as Betrayal to apply, but not as firm as a matte lipstick. The patchiness visible on my top lip was not visible at all when seen from a normal distance. I simply adore this colour - I couldn't get over how normal it looked on my lips for such an intensely rich jewel tone. 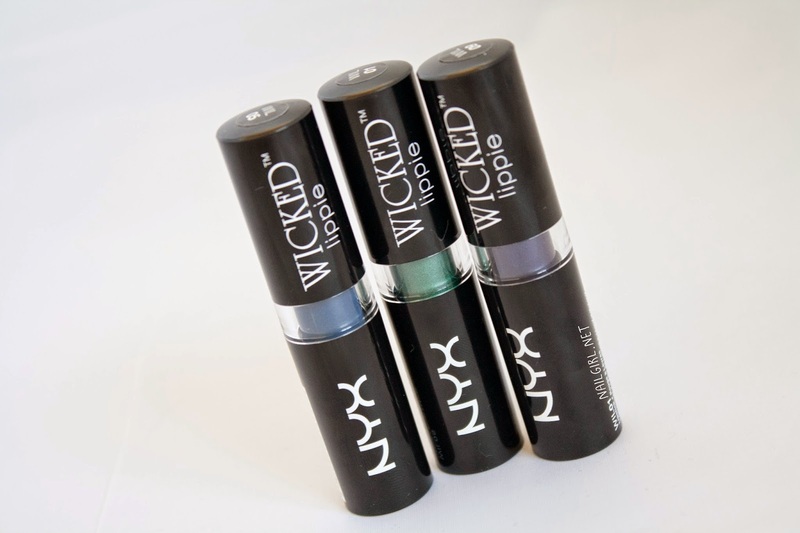 Sinful is a medium blue lipstick with very subtle blue shimmer. Unfortunately the shimmer didn't come out to play on my lips, however I do like the effect of solid blue on my lips. As with Risque, the patchiness on my top lip was not viewable from a normal distance. Again, I found this surprisingly wearable for such an odd colour. All three of these lipsticks have a very moisturising base, unlike the matte lipsticks that I am so used to. This difference makes them comfortable and easy to wear, but slightly trickier for me to apply. These lipsticks also inspired me to do some matching lip/brow looks! I followed this fantastic tutorial for coloring in my brows. Here, I'm wearing Sinful on both my lips and brows. The only additional makeup I'm wearing is eyeliner and mascara. Have you tried any of these lipsticks? Or colourful brows? Lemme know in the comments!